Police said all the occupants in the vehicles were transported to Sunrise Hospital after the crash. The other injuries are reported to be non-life threatening. A child has died in a three-vehicle crash near Eastern and Harmon avenues Friday morning. 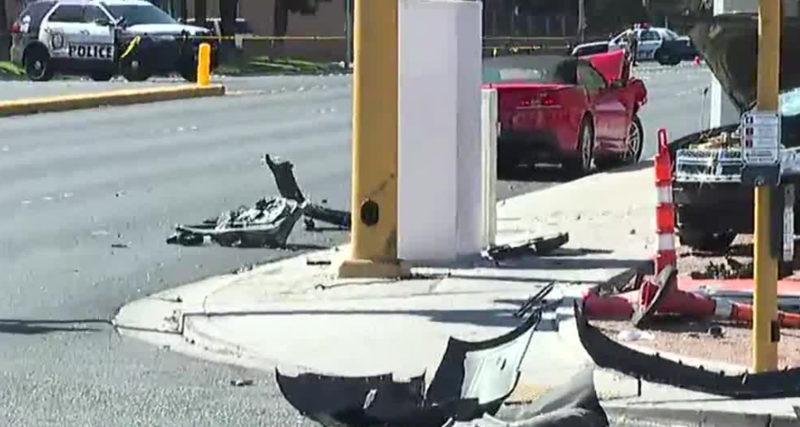 According to Las Vegas police, the vehicle believed at fault, a red Chevrolet Camaro, went through at least one red light before T-boning another vehicle, which then spun and hit another vehicle. 25-year-old Aylin Alvarez-Perez was arrested in the crash on reckless driving and DUI charges. Police said she was “grossly exceeding the speed limit” when she ran at the red light at the intersection of Harmon and Eastern avenues. She had minor injuries. Her mug shot was released on Tuesday. The Camaro initially hit a Dodge Avenger when then crashed into a Hyundai Sonata. An 8-year-old boy in the Dodge died as a result of his injuries. He was later identified as Levi by family and friends . The 41-year-old male driver of the Dodge had moderate injuries and the 33-year-old female driver had critical injuries. They were all transported to UMC Trauma. A 42-year-old man in the Hyundai had moderate injuries while the 68-year-old female driver had minor injuries. Las Vegas police Capt. Nick Farese called the situation frustrating and that the crash was preventable. The intersection of Eastern and Harmon Avenues reopened by 3:45 p.m. Friday.